From its humble beginnings in 1969 as a low-cost manufacturer of black and white TVs for the Asian market, Samsung has grown into a global brand. While most well-known for its consumer electronics and mobile phones, its brand and business portfolio are diverse. In this article, we explain a little more about this business, its most profitable semiconductor division, and its future business potential. Solid financials underpin this potential, and despite a strong dividend and very strong free cash flow, Samsung shares are available at a relatively reasonable price. We therefore maintain a top 10 holding in the business in the SIM Global Emerging Markets Fund. Samsung’s past tells us a lot about its potential future. Samsung started as a low-cost manufacturer of black and white TVs. Samsung was incorporated as a low-cost manufacturer of black and white TVs in 1969. Over the following decade it expanded and began manufacturing microwave ovens, washing machines, refrigerators and many other consumer products to be exported to Western consumers. In the 1970s, Samsung acquired a semiconductor business that set the stage for its future growth in electronics. In the 1980s, Samsung took steps to become a global brand. Samsung followed a different strategy to its Asian competitors. It sought to be recognised as a global brand and therefore focused on manufacturing quality and technical leadership, reinvesting its profits in R&D, state-of-the-art manufacturing, and supply-chain activities. During the 1990s and 2000s, they invested in innovative premium products and manufacturing. In the 1990s and 2000s, Samsung began to emphasise manufacturing as a core competency, rather than just investing in innovative premium products to enhance its brand value. The company embarked on a strategy of vertical integration, competing with every one of its outside suppliers that delivered products for its internal business. By following this strategy, they were able to ensure that their internal supply chain infrastructure was competitive. Today, Samsung Electronics is a very distinct global technology company. They have a diverse branded product portfolio. This spans TVs and video and audio equipment; computers and related products; cellular phones; home appliances; network-related products; factory automation products; fiber-optics products; closed circuit security products; motors and compressors; and solar energy systems. Semiconductors are a core source of profitability. Many people know Samsung for their amazing home appliances and mobile devices; and their mobile and consumer electronics divisions are important to Samsung’s revenue. But the most important business segment and biggest contributor to profits is its semiconductor business. Approximately 57% of operating profits is attributable to the semiconductor business. Why we think Samsung is a great investment opportunity. 1. The semiconductor business is benefiting from the global demand for data storage and processing. 3D NAND (a data storage technology that is more reliable and cost effective than conventional flash/USB memory) technologies. The demand for server DRAM has increased. Cloud service providers have been increasing their server DRAM content to accommodate the growing number of data centres. Data centre traffic is expected to increase from 4.7 zettabytes in 2015 to an estimated 15.3 zettabytes by 2020 as global cloud servers surpass traditional servers. There are currently 346 hyperscale data centres worldwide and it is forecast that 53 more will be built globally. In 2015, 52% of the installed servers were traditional and 48% cloud-based; by 2020 it is estimated that 77% of all installed servers could be in the cloud. Samsung (45%) and its two biggest competitors, SK Hynix (29%) and Micron (21%), currently have a combined 95% share of the global DRAM market. Samsung is the only one of these three that focuses its manufacturing on high-end products, making it likely that Samsung should be the major beneficiary of greater demand for server DRAM. 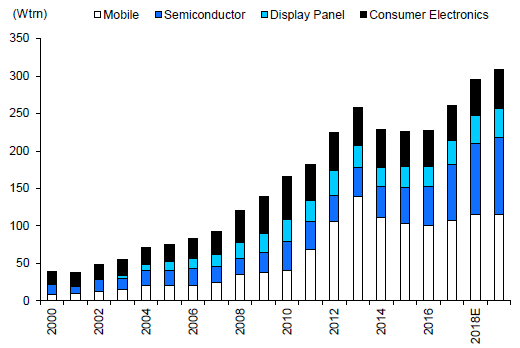 Samsung has managed to extend their dominance through early and superior execution on 20 nanometer (nm) semiconductors. While their competitors are still struggling with 20nm, Samsung has already started mass production on sub-20nm semiconductors. Samsung will also be the major beneficiary of the transition to 3D NAND. This technology has superior attributes (light weight, low power consumption) and lower costs, which will propel its products to rapidly displace traditional hard drives. Samsung is currently second relative to its peers with a 34% market share, but is well positioned to become a market leader with its first mover advantage in the mass manufacture of 3D NAND. Samsung is striving to transition from 64-layers 3D NAND to 92-layers 3D NAND and it is believed that it will be able to stack more than 100-layers by 2019, in turn further bolstering its cost competitiveness. 2. Profits from the display division are expected to improve thanks to lighting panels for phones. 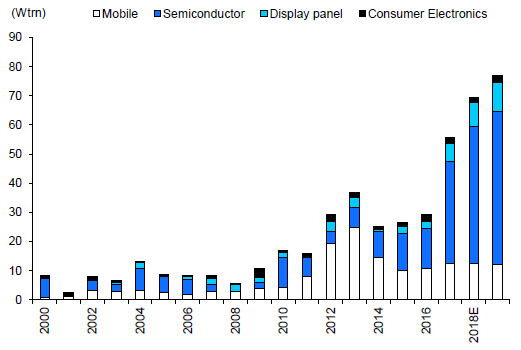 Profits from the display division are expected to improve thanks to solid Organic Light Emitting Diode (OLED) sales growth. OLED is a superior display technology that will be the ‘next big thing’ for smartphones. It offers higher resolution, bendability, as well as lighter and thinner design. Samsung is the dominant display maker of OLED and has an intellectual property barrier to entry. Sales are currently heavily dependent on the performance of Samsung’s mobile division and will remain under pressure until the display division diversifies its client base. At the end of 2016, OLED had less than 20% share of the smartphone panels market. It is estimated that as OLED penetration increases substantially with the Galaxy S8 as well as Apple’s new iPhone 8 and X series in 2018, they could achieve market penetration of 50% by 2020. It is therefore likely that the display division will see significant profit growth over the next few years. 3. Dividends should double, and the cash balance and free cash flow are expected to increase. Samsung has revealed its 2018-2020 shareholder return guidance, which now focuses on consistent distribution of cash to shareholders and effectively doubles the dividend from 2018. Although this is a very positive step forward, there is still potential for more returns. The reason is that this represents just 50% of free cash flows (FCF), and in the absence of any mergers and acquisitions, both the cash balance and FCF are expected to continue to grow. Samsung’s valuation is very attractive, with a price to earnings ratio of only 6.2x. We believe Samsung’s market-leading position within DRAM and 3D NAND will continue to drive its revenue growth and solid operating margins into the future. 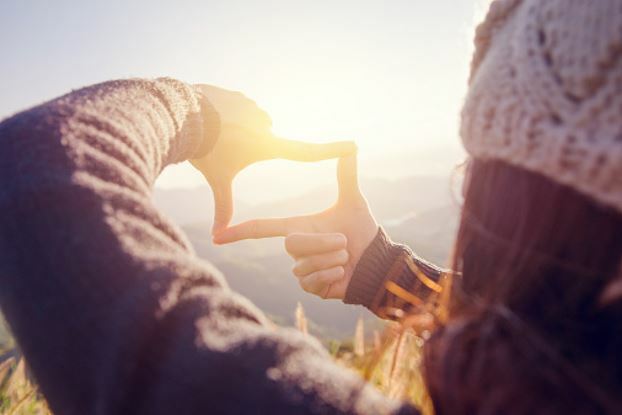 Its OLED technology, while still at an early stage in its development, will be a strong driver of future revenue growth and operating profits for the group. It is our opinion that Samsung’s valuation remains attractive and at a price to earnings ratio of only 6.2x, it trades at a significant discount to global emerging markets and other technology producers. We therefore maintain Samsung Electronics as one of our top 10 investments in the SIM Global Emerging Markets Fund. SIM stands for Sanlam Investment Management. Denker Capital is an authorised Financial Services Provider, and an appointed investment advisor to Sanlam Investment Management (Pty) Ltd an authorised Financial Services Provider. The information in this communication or document belongs to Denker Capital (Pty) Ltd (Denker Capital). This information should only be evaluated for its intended purpose and may not be reproduced, distributed or published without our written consent. While we have undertaken to provide information that is true and not misleading in any way, all information provided by Denker Capital is not guaranteed and is for illustrative purposes only. The information does not take the circumstances of a particular person or entity into account and is not advice in relation to an investment or transaction. Because there are risks involved in buying or selling financial products, please do not rely on any information without appropriate advice from an independent financial adviser. We will not be held responsible for any loss or damages suffered by any person or entity as a result of them relying on, or not acting on, any of the information provided. Richard joined the team as an equity analyst in 2011 and has been responsible for researching emerging market equities since 2015. After completing his articles with RSM International in 1999, he spent 11 years with the company as a consulting and audit partner. 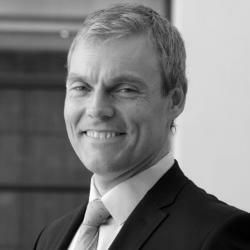 During his last three years with RSM International, he actively managed domestic and international portfolios for the Cape Town partners’ retirement funds.